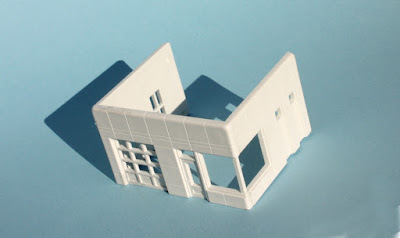 I began this series of posts with background about Union Oil, including information about how its service stations looked, in the first post (you can see it at this link: http://modelingthesp.blogspot.com/2015/12/modeling-gas-station.html ). 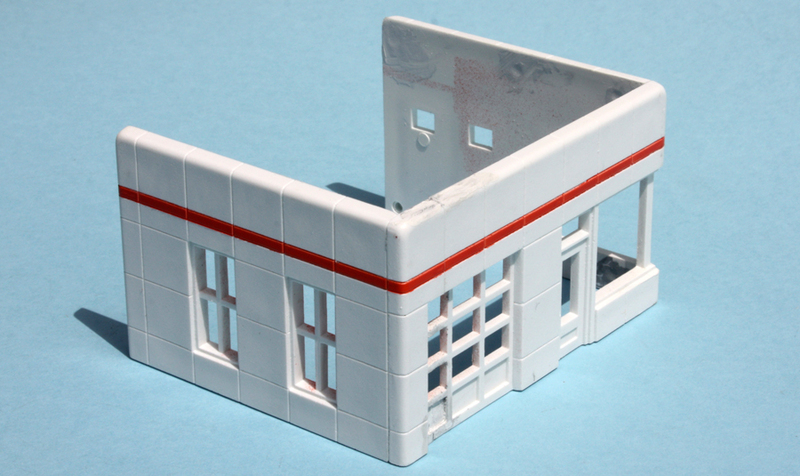 Then I began the modeling work of kitbashing a City Classics gas station kit, to fit the site on my layout. 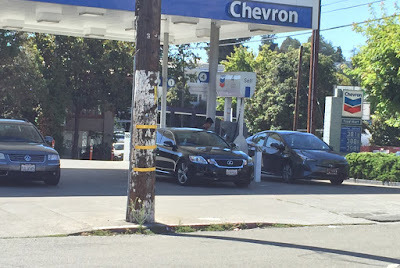 That post is available here: http://modelingthesp.blogspot.com/2018/08/union-oil-gas-station-part-2.html . In the present post, I continue with modeling. My first step in assembling the building was to glue the three “outside” walls, the front and both sides. These are the three sides represented as having the porcelain-enamel steel panels as sheathing, and thus the part that can receive a color stripe. 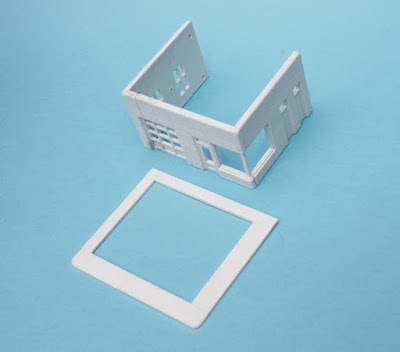 After carefully filing away the draft angles on the sides and bottom of each wall, I glued them together with conventional styrene glue, making sure joints were thoroughly wet so they could be squeezed together and make a tight joint. I did this with a machinist’s square inside each corner, with the walls sitting vertically on a flat surface. This kept the bottom edges of all the wall pieces in a single plane. The back wall, not shown, has also been cut down to fit into the shortened building, but I wanted to do the color stripe just on these parts, without having to mask or worry about the back wall, before inserting that wall. Meanwhile, of course, the kit base has to be adjusted in size to match the building. 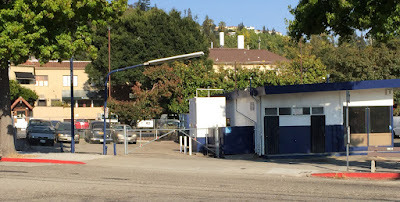 A concrete “pad” is pretty standard under service station buildings like this, even today, and this kit nicely indicates ramps into the service bays. This is the way to locate the cuts in the front part of the base, making sure the ramp lines up. A square cut and the usual glue procedure gives you the shortened front base. I used the excellent Tamiya masking tape to mask off the narrow panel above the windows on the station building (for more about Tamiya, see: http://modelingthesp.blogspot.com/2018/08/a-shout-out-for-tamiya-products.html ). This tape is very flexible and readily can be pressed down into narrow gaps or around protrusions. I then sprayed a deep orange, to reflect the usual Union Oil color. I considered a wider stripe, but decided this would suffice as an accent. Before going further with the building itself, I decided to make sure the site is all right. A key point with any commercial structure like this is that it sits at the height of the sidewalk, that is, above the curb height, rather than on the ground at road level. Below I show a photo of a service station near my home, to illustrate. The wide driveway has red-painted curbs at each edge, which helps them stand out. The station shown above has concrete driveways and sidewalk, but is asphalt-paved inside the station, except for right between the pump islands. Other stations may have a complete concrete pad within the station property, like the one shown here. This curb is fairly low. I will continue my description of modification and completion of this kit in future posts.